„Maximal Strength is the Mother of all Strength Qualities„. Prof. Schmidtbleicher is almost 70 years old and looks back on over 45 years of working as a sports scientist, constantly assessing a multitude of high level athletes, teaching at the university, at conferences, for the IOC and other governing bodies all over the world on strength training, as well as staying sharp and on the edge of the most progressive and innovative findings in the modern era of sports science. 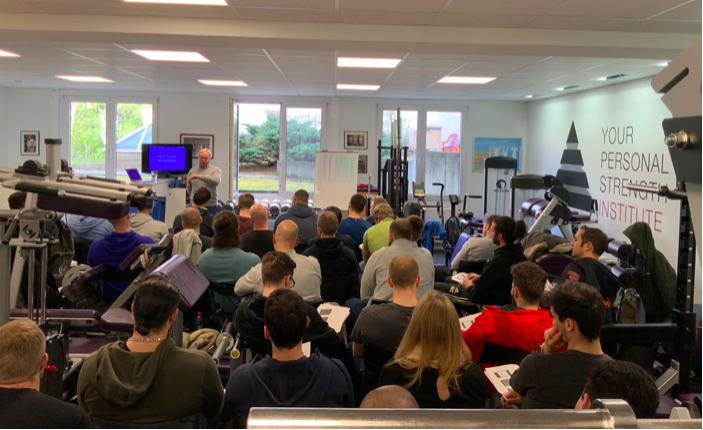 During the seminar he addressed many topics such as the neural and metabolic components of increasing maximal/explosive strength and hypertrophy, the value of electro muscle stimulation training, occlusion training, flossing, vibration plates and much more. His great sense of humor and his teaching abilities from working on university level for 40 years combined with his wealth of sports science knowledge made it a great day at the YPSI. 95% of all German World Champions and Olympic Champion have the „Abitur“ which is the highest school degree in Germany and received after 13 years of school and an exam. That makes a clear point. Athletes with a high level of education have a higher chance to succeed on a high level of sports. The assumption can be that a higher level of education is the base to make better choice in important aspects of sports such as training approach and decision making during competition. There is german research that has shown that training for strength endurance will decrease endurance due to damage of membrane of the mitochondria from oxidative stress which is a side product of stressing the lactic acid system. Prof. Schmidtbleicher presented research that has shown a 6% to 9% decrease in ATP Production in the aerobic energy system due to strength endurance training. Personally working with cyclists, triathletes and a runners I have never focused on strength endurance work for other reasons such as low maximal strength levels in this clientele, lack of muscular balance, poor posture and of course a low level of specificity of strength endurance for an endurance athlete. This makes strength endurance work as a waste of time to improve endurance. Yet, as Prof. Schmidtbleicher pointed out in this research it goes further than a waste of time, it has actually a diminishing effect on endurance. That means, training for strength endurance will make an endurance athlete slower. I repeat, training for strength endurance will make an endurance athlete slower. A statement that many will answer will a smile is actually a very profound statement. There is zero research that has shown that warming up decreases injury. There is plenty of competition analysis though, that shows that the majority of injury happens in the later parts of the competition which automatically solidifies the first statement as in the later part of a competition the „warming up“ effect is sufficiently achieved. On the same topic he pointed out the high value of post-tetanic potentiation as a neural activation method to increase transmitter levels at the neuromuscular junction, which has been clearly shown to increase performance in primarily explosive strength. This makes two strong points for everyone that believes in the necessity of „warming“ up the body to prevent injury, science shows this is clearly not the case. Second, this highlights the effect of activating the nervous system through strength training to maximize the performance output in regards to explosive strength. I had the pleasure to talk to Prof. Schmidtbleicher before the seminar and over lunch where he had some great stories, from assessing athletes like the first United German Bobsled Team in 1991 and their severe differences in Max Strength and Explosive Strength levels between East German and West German Bobsled athletes as well as their training methodologies at the time, to teaching Olympic Trainers for the IOC in exotic places like Uganda, Nepal and Katmandu. He has a wealth of knowledge and experience in sports science that many more trainers should learn from. And therefore I am happy to host Prof. Schmidtbleicher a second time at the YPSI this year, this time in english, for the YPSI Strengthtraining & Sports Science Seminar with Prof. Dr. Dr. Dietmar Schmidtbleicher on July 10th 2019. Picture: Prof. Dr. Dr. Dietmar Schmidtbleicher speaking at the YPSI in march 2019.